This fine savonnette* style ladies' pocket watch has been crafted in 18ct yellow gold. The hinged half hunter** style front cover displays Roman numeral hour markers within a opaque guilloche enamel, scallop-shaped design around the minute marked chapter ring which encircles the central circular 'window'. 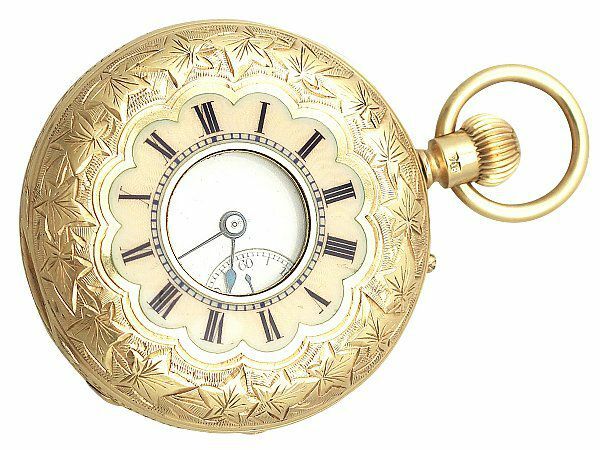 The exterior covers of this exceptional example of an authentic antique solid gold half hunter pocket watch are embellished with impressive bright cut engraved decoration depicting ivy leaves to the anterior cover, and flower and leaf designs around a scallop-edged central trellis pattern. The watch case has a hinged back plate and interior hinged cover, both of which are clearly hallmarked. The front cover is released by depressing the hallmarked crown/winder. The bow is also hallmarked. The white enamel dial is encircled with black Roman hour markers within a minute marked chapter ring, with the subsidiary seconds dial at six. The dial displays the serial number 71091. This impressive ladies gold pocket watch is fitted with blued steel double spade hands. The interior of the reverse hinged cover is fully hallmarked and opens to reveal the hallmarked inner cover, which in turn opens to reveal the movement. The movement is signed by Tho, Russell & Son, Liverpool. in addition to the serial number and 'Makers to the Queen'. NOTES *Pocket watches are normally classified according to the relationship between the seconds dial and the winding stem. If the two are at positioned at a 90 degree angle then the watch is a savonnette (sometimes spelled 'savonette'), if the two are in line then the watch is a lepine (named after Jean-Antoine Lépine). **A savonnette style watch with a full metal cover is known as a Hunter. Savonnettes with a window to the centre of the cover through which the position of the hands can be seen is known as a Half Hunter or Demi Hunter. This ladies pocket watch is a very good gauge of gold, fine quality, and in exceptional condition. The enamel dial is in perfect condition and the hallmarks are clear. The decoration to the exterior covers is in exceptionally crisp condition. The movement has been professionally cleaned and serviced, and is in full working order. If necessary AC Silver is happy to assist you with any repair query in the future, however as this item is antique we are unable to guarantee parts will be replaceable. Reflections in the photographs may detract from the true representation of this item.